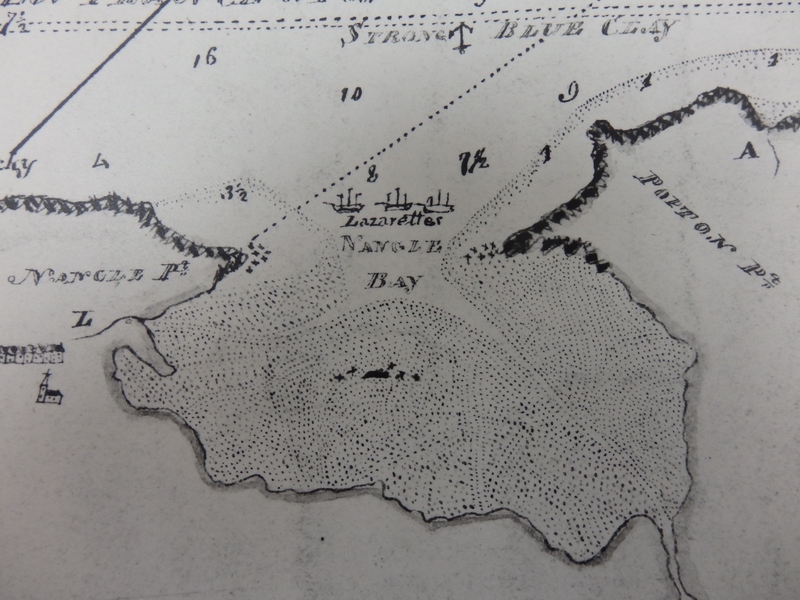 Anyone who looks at early 19th century charts of Milford Haven will notice a curious feature – a warship, or sometimes a small group of warships, at anchor off Angle Bay. These were in use as lazarette (or lazaretto) hulks, principally for the airing of cargoes of cotton coming into Britain from the Levant, particularly Egypt, and they were a feature of the Haven for over half a century. Strangely, though, their history seems to have been almost completely forgotten: the local museums have no mention of them, and even those well versed in the history of the area seem not to have encountered their story. This is surprising, as the history of the Milford Haven quarantine station and its lazarettes gives the area a direct connection with some of the most famous and interesting ships of ‘Nelson’s Navy’. Preventing the entry of plague and other contagions into the British Isles was an important priority for governments in the eighteenth and nineteenth centuries. Ships sailed from the Mediterranean with ‘clean bills’ or ‘foul bills’; if the latter, they had to perform quarantine on arrival. The principal lazarette station was Stangate Creek at the mouth of the Medway, which had been established in 1709; another was sited at the Motherbank off Ryde, with smaller ones in other parts of the British Isles. 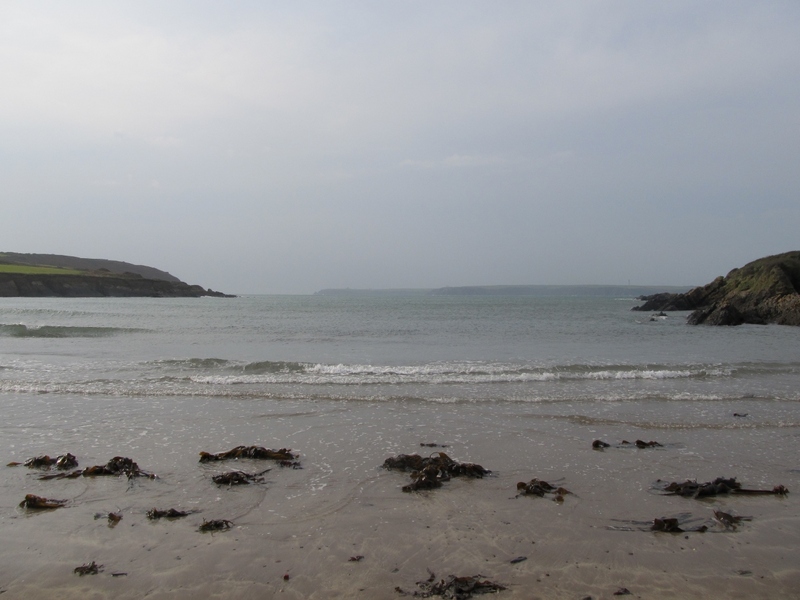 In 1805, a decision was taken to establish a new quarantine station at Milford Haven. This was formally established by an Order in Council of 5 April 1805, under the terms of the new Quarantine Act; initially, it was to be the station for ships heading for North Devon or Cornwall, or the Welsh coast from Llanelli to Aberystwyth, and was to be an option for ships bound further north, even as far as the Isle of Man and Carlisle, but it swiftly became a port of call for ships bound for Liverpool. The station was to have a superintendent earning £100 per annum, paid quarterly, plus £1 for each ship on which he performed quarantine, with the balance made up if necessary so he would receive a minimum of £200. The master of each lazarette ship earned £100, plus 10 shillings per ship, a mate £60 plus 7s 6d per ship, and so on. The establishment of the station reflected the fact that the incoming cargo most likely to be infected, Levantine cotton, was now more likely to head for Liverpool as London. In July 1813 Milford was made an alternative foul bill station to Stangate Creek for ships from Mediterranean and Western Barbary, but was not to be used by ships which actually had plague on board; these were to continue to proceed to Stangate, as in the past. The first warship to take up station in Angle Bay was the old Fifth Rate frigate Syren; a plan of her as she was at Milford survives in the collections of the National Maritime Museum. The station was expanded in 1813 by the addition of the old 74-gun Triumph, and by 1816 five ships were stationed there. In 1824, an intense debate took place about the utility of the Milford Haven quarantine station, given the difficulty of moving cleared goods onward from there to Liverpool. By then the station had only one ship, the Triumph, with the Santa Margerita having been moved to Bromborough Pool near Liverpool; ship masters preferred to sail directly there, rather than perform quarantine at the inconvenient and remote anchorage in Milford Haven. Between 1821 and 1823, only 25 ships performed quarantine at Milford – a tiny number compared to the 888 at Stangate Creek, or the 410 at Liverpool. Despite this, it was the second largest facility, possessing two lazarette hulks (before the Santa Margerita‘s move), a hospital ship and a pursuit cutter, with a total of 45 men employed. An outbreak of contagion in the Mediterranean, and the despatch of a very large number of cotton cargoes from Alexandria, led to a huge expansion of the station. Three ships of the line were said to be needed for Milford, but initially only the Dreadnought and Saturn were provided. Even then, their orlop and lower decks were useless due to a lack of venting, while the upper decks were completely exposed to the Welsh weather. 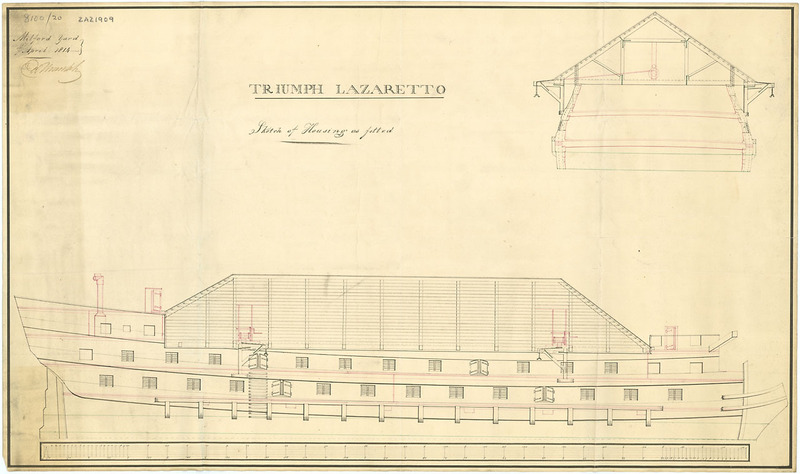 Consequently, the nearby royal dockyard at Pembroke Dock was asked to provide the ships with low roofs; the yard also regularly carried out repairs on the lazarettes in later years, and broke them up at the end of their lives. By October 1825, the station had no fewer than nine lazarettes, including the enormous Ville de Paris, together with a hospital ship, the Otter. The staffing and victualling of the station were reformed at much the same time, and in April 1826 Captain John Marshall was appointed superintendent of quarantine at Milford at £350 per annum. Under him were two lieutenants at 10 shillings a day, while another three lieutenants were appointed masters of the lazarettes then in use, the Akbar, Santa Margerita, and Hannibal. The crews of the lazarettes evidently became closely involved with the local community: in July 1826, for example, Robert Salusbury, master of the Hannibal, married a Miss Thomas of Milford. Marshall himself, though, did not stay for very long, being transferred to the command of Stangate Creek in 1827. Thereafter, Milford’s fortunes fluctuated. In July 1827, the Akbar and Newcastle were transferred to Liverpool, and the Otter and the Nepean guardship were declared superfluous; the station’s manpower was significantly reduced in April 1828. A cholera epidemic in northern Europe in 1831 led to a sudden flurry of renewed activity, as well as an emergency closer to home – the fumigating apparatus from the ships was sent ashore to deal with an outbreak of fever in Haverfordwest gaol. Only 45 ships cleared quarantine at Milford in 1832, so the establishment lost the Hannibal and Dragon (although the latter only moved a little way up the haven, to become a floating barracks for the Royal Marines contingent guarding Pembroke dockyard). Further cuts were made in 1844, when one lazarette ship was removed and one mate, one purser, three mariners and two boys lost their jobs; by January 1845, only the Ville de Paris, Milford and Triumph were left at the moorings in Angle Bay, and the first two of these did not survive much longer. The venerable Triumph lasted until she was broken up at Pembroke Dock in 1850, having performed a final service as a floating cholera hospital for the town during the epidemic of the previous year. The last ship on the station seems to have been the Hope cutter, which was taken out of service in 1865. Perlen 1804 38 Danish; captured by RN 1807 Fitted for lazarette at Milford, Feb-Mar 1813; transferred to Liverpool January 1821. Broken up 1846. Triumph 1764 74 Took part in Batle of Camperdown and Calder’s action; commanded by ‘Nelson’s Hardy’, Philip Affleck, Sir Erasmus Gower, etc To Milford October 1813; broken up at Pembroke Dock, June 1850. A huge amount of mercury was said to have been discovered aboard her when she was broken up. Santa Margerita 1774 36 Spanish; captured by RN, 1779 To Milford 1814; moved to Liverpool 1825; broken up 1836. Milford 1809 74 Built at Milford dockyard*; Fremantle’s flagship in Mediterranean, including at capture of Trieste To Milford June 1825; broken up at Pembroke Dock, July 1846. Newcastle 1813 60 Commanded at one point by Lord George Stuart, son of 1st Marquess of Bute, and chased USS Constitution in War of 1812 To Milford June 1824; transferred to Liverpool Sept. 1827; broken up 1850. Additionally the 74 Renown of 1798 was ordered to be fitted as a lazarette for Milford in 1825, but never seems to have gone there; and the Hope cutter was briefly on the station in the early 1860s. * I will be giving a paper on the curious history and ‘afterlife’ of the short-lived royal dockyard at Milford Haven (not to be confused with its much better known successor at Pembroke Dock) to the annual conference of the Naval Dockyards Society at the National Maritime Museum, Greenwich, 25 April 2015. This paper will be published in a future volume of the Society’s Transactions. The Navy List, various editions, 1805-70. Nineteenth century newspapers accessed via the British Newspaper Archive, Welsh Newspapers Online, and Swansea Council’s online index to the Cambrian newspaper. This entry was posted in Milford Haven, Pembroke Dock, Uncategorized, Welsh naval history and tagged HMS Dragon, HMS Triumph, HMS Ville de Paris, Lazarettes, Quarantine on November 13, 2014 by J D Davies.